What better way to add some excitement to the school year as it winds to a close? My nephews Trae and Tyler honored our racing team by allowing us to show off our '06 car to their classes. The opportunity to inspect a race car close up and ask questions seemed to really distract their minds off of the class work earlier in the day. The excitement peaked when they were able to hear the engine roar to life, as well as a few quick rev's. It was even exciting enough to steal some attention away from recess in a nearby playground! 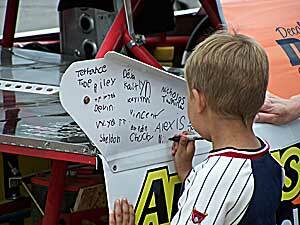 Autographs aren't just for the drivers to sign either! 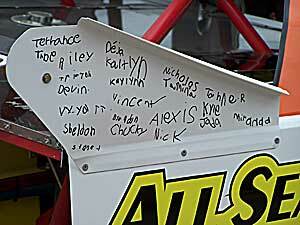 There is no better way for us to remember the fun at the show and tell than a few autographs for our collection. Not only will this definitely be a nice memory for us to hang on our wall when the season is finished, but it will leave a lasting memory for the students to tell their friends as well.